BANGI, 27 Oct 2013 – The National University of Malaysia (UKM) is one of the few universities in the country that gives all its students knowledge, skills and experience to become entrepreneurs. Vice Chancellor Prof Tan Sri Dato’ Seri Dr Sharifah Hapsah Syed Hassan Shahabudin said, UKM students are nurtured to be able to generate job opportunities instead of just seeking employment. “Every year we hear graduates lament: I got my degree and now what? UKM has put a stop to that by making entrepreneurship a compulsory subject for all its under graduates. “Thus when they graduate, they have the right mind set whereby getting a job is only one option. When they have the right mindset coupled with the knowledge and skills needed they can turn their passions into money making ventures”. Such mindset can help making innovation and entrepreneurship a culture. This can be the foundation to economic growth and social well being, she said. Prof Sharifah Hapsah said that was only one aspect where UKM is leading as a University that is not just churning graduates but try to ensure that they are not at the mercy of the job market, once they receive their scrolls. UKM has also made achievement in other areas, among them the Advance Surgical Skills Centre in the Medical Faculty which has received recognition of the 500 year old institution Edinburgh Royal College of Surgeons as an institute that can produce the best surgeons in the world. The Law Faculty which is commonly viewed as something lofty and self righteous has also got down to the ground to reach out to the community. It has set up a legal aid clinic to give legal representation and advice to the less fortunate for free. While the Education Faculty has now come up with a new Doctor of Philosophy in Education programme in a bid to make Malaysia as the hub of educational experts. 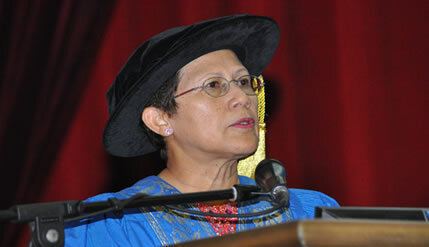 UKM Chancellor, Tuanku Muhriz ibni Almarhum Tuanku Munawir presented scrolls to the graduating students.